March 22nd is World Water Day. Over two billion people in the world still lack access to safe drinking water, and 4.5 billion don’t have access to proper sanitation, according to the World Health Organization. The United Nations (UN) is working to achieve it’s Sustainable Development Goal 6, the goal of which is to ensure that everyone has access to clean water by 2030. Great strides have been made in improving access to clean drinking water and better sanitation management in developing nations. However, these successes have been overshadowed by increasing water shortages and projected water demands. Population growth coupled with climate change will have major impacts on water availability in the future. This is where the European Space Union (ESA) and other satellite monitoring programs come into play. Less than three percent of all water on Earth is freshwater, and of this, less than one percent is accessible for drinking and agriculture. Most of the world’s freshwater is frozen in glaciers and icecaps. With so little accessible freshwater and rising demands, it has never been more crucial to monitor the world’s freshwater sources. 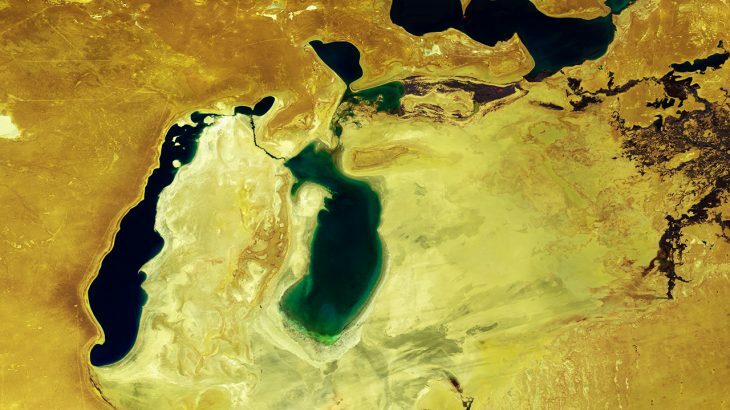 ESA satellites like the SMOS mission and the Copernicus Sentinel satellites are currently being used to track water availability and changes, bring attention to receding lakes and reservoirs, and even calculate soil moisture. Satellite monitoring will play an increasingly important role in conserving and managing our natural resources, especially as climate change and expanding infrastructure threaten to degrade many key coastal, woodland, and freshwater habitats. The Copernicus Sentinel-1 and Sentinel-2 satellites, as well as ESA’s CryoSat, are also being used to monitor changes in glaciers which is important for regions like the Himalayas where ice fields provide freshwater to nearly 20 percent of the world’s population.